It was a carbon-copy of the error he made in Q1 two years (pictured below), and had the same effect because the damage was too severe to fix in time for qualifying so Verstappen will start Sunday's race last. Asked what other drivers thought of Verstappen's crash repeat, Force India's Perez said: "Those things happen. But if it happens after you've done it [before] then it means you haven't learned. "It can happen to anyone, we're all pushing really hard. If it happens twice then it means you're not learning about it. "We put our wheels millimetres away [from the barriers], and from the couch maybe it's easier to judge. "But you should learn from your mistakes." 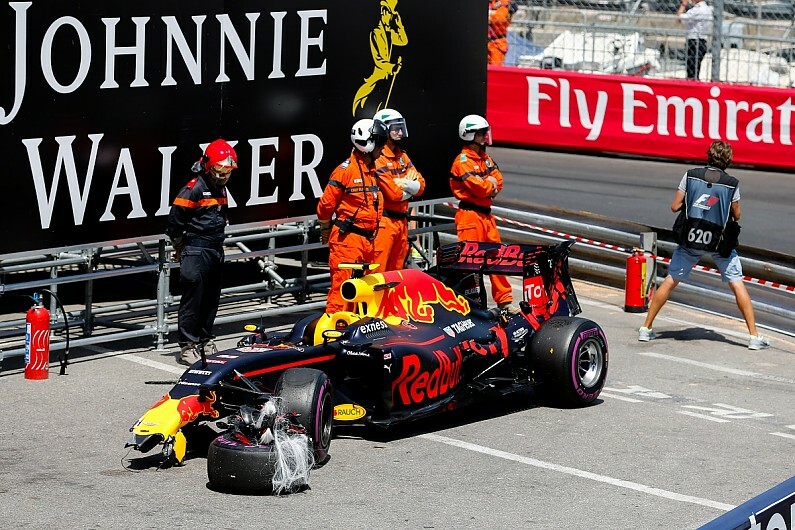 Verstappen has been involved in multiple incidents this season, most notably a clash with Lewis Hamilton in Bahrain and then clumsily spinning Sebastian Vettel in China. The 20-year-old has been hailed as a certain future world champion, but 1997 title winner Jacques Villeneuve reckons the Dutchman will not achieve his potential without changing his approach. There's some nasty damage to that Formula 1 car! Max is 20 and has mountain of talent, l am not sure how much of his fathers influence gets in his head , but he needs a mentor who is not a hothead to help him develop IMO. He is younger than me then!